You have a webinar topic in mind that you think is awesome and you’re sure your audience will love it – but how are you so sure? You need to choose a topic that will interest viewers enough that they’ll want to come back to you for more valuable information in the future. Here are 5 important ways to ensure you’re choosing an interesting webinar topic for your audience. Pin down your target audience. Are they existing clients you want to up-sell to or provide thought leadership to? Are they partners or volunteers? Are they exporters looking to grow their reach fast? Are they key influencers you want to take your message viral? Once you know whom you want to attract, fine tuning your topic and the benefits of each webinar will be much easier. Aim to deliver awareness-building, educational content to your customers in order to provide them with content that they appreciate. Know what the pain points and opportunities are for the participants. Ask yourself: What pain points are prospects or customers feeling or what opportunities are they missing out on right now? That’s a great starting point for coming up with a list of possible topics that might be of interest to clients. Get together with your colleagues, group similar ideas, and then vote on which ones you think offer the most useful information for this particular audience. Try to select a topic that's broad enough to attract a large audience, yet targeted enough to provide actionable advice that attendees can implement the second they hop off your webinar. You want your webinar participants to walk away from your session with some great webinar takeaways. After your brainstorming session, you’ll ideally have at least 2 or 3 topics to leverage in order to fuel your webinar broadcasting funnel. The more niche the topic, the better. What do you find yourself explaining again and again to your clients? What do your clients or prospects want to learn about? What is the most valuable thing you could share in 45-50 minutes? These questions will help you pinpoint where to focus your energies so you’re effectively catering to your audience’s needs and interests. Cut to the chase by making each webinar have a singular purpose. What is the main focus of your webinar? Can you sum this up in one sentence? This will help you deliver the benefits quickly, as there is usually more you can say than you have time for. Remember that most webinars are 30-45 minutes long followed by Q&A for 10-15 minutes. Call out the core benefits of each webinar. 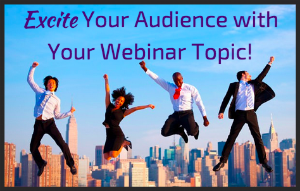 When you know your webinar topic and the singular purpose for that session, you need 3 or 4 compelling benefits for your target audience to attend. Each webinar should deliver a few attractive key takeaways for the people who’ll be tuning in. The purpose of delivering webinars is to offer value to your audience. Making sure each of your webinars is sufficiently beneficial is an excellent way to retain customers. Once you’ve mastered these 5 important practices, you’ll be delivering interesting, valuable webinars that will not only excite viewers, but also give them assurance that you understand how to help them. Know exactly whom you’re talking to, what they want to hear, and how to optimally deliver this information. If you’re interested in gaining more tips on how to grab the attention of your webinar attendees, check out this informative blog mini series!